In the middle of an impending nor'easter, it is hard to believe that Spring is just around the corner. Dave and Stacy are preparing for another season of presentations. Several slots are still available for Women's history programs in March (after the 8th). Now is a good time to book "Mother, the Queen of My Heart," which is only offered in early May. It seems odd to think about Christmas just after the summer solstice, however, if you are seeking stories or carolers for December programming, NOW is a good time to contact us about David's Christmas Stories or our Quartet Spiced Punch, now in our 20th year of historical caroling. When July 4 rings in the end of the Spring 2012 season, Stacy will be taking a 12 week hiatus to attend to personal and family affairs. 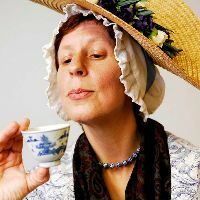 Bookings for "Over Here Molly Pitcher" will be accepted for programs starting in mid-October 2012, those for "Soldiers Without Guns: Women Defense Workers of WWII" beginning in November, and "Revolutionary Tea" in December." Another hiatus is planned for the typically slow season of January and February, with programs commencing again in March 2013. This break does not affect David's schedule. 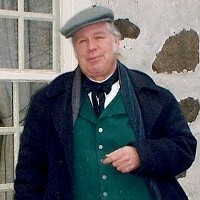 Contact us for Irish Stories, George Washington, Davy Crockett, or his program on 18th Century Tavern Beverages. It is with great sadness that Stacy relates the passing of her father, Richard N. Roth, an Air Force veteran of WWII, who took his final flight on March 19, 2011. This was followed by the death of Stacy's Aunt Evelyn, who was a WAVE during the War. As a consequence of these events, Stacy is a bit behind with History on the Hoof paperwork and has had to make some adjustments in her performance schedule. In the works - a public event featuring WWII living history exhibits and displays coupled with a big band concert in honor of her father, who was passionate about jazz and swing music. The date is November 13, 2011, 12-4pm. Location: Howell Living History Farm, 70 Woodens Lane, Lambertville, NJ. www.howellfarm.org. The event will open with exhibits by groups including the Army Air Forces Historical Association, the 45th Infantry (recreated), Len Enourato's WWII Museum, and Rob Flory (radio equipment). From 2-4 pm, we will feature a concert by the Full Count Big Band. There will be floor space available for dancing. Download a flier here. David's Shannachie of Glendunbunn Ballybeg will be featured at two unique festivals this month: The first, on March 6, 2011 is a day-long Gael Scoil for young people interested in Celtic Culture. In addition to stories by David and fellow storyteller Tom Slattery, attendees will learn about traditional Celtic music, Celtic foodways, Celtic culture. The Scoil takes place from 8:30am to 3pm in Lawrenceville, NJ. Enrollment is required. For information, see http://www.aohdiv10.org/gaelscoil . The event is sponsored by the Ancient Order of Hibernians, Division 10, Hamilton, NJ. "Are you married?" Folks often ask us if we are husband and wife. "No, but we play them on TV," we like to say. Stacy and Dave began performing occasionally together in 1992, and launched History on the Hoof in 1996 In 2008, Stacy married John Niemiec of Fairless Hills, PA, a military history enthusiast and reenactor of many different time periods. 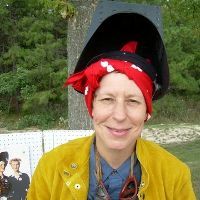 If you hear of Stacy Flora Roth, Stacy Flora Roth-Niemiec and Stacy Roth Niemiec, they are one in the same person. Stacy has named her new defense worker character "Rose Helen Niemiec" in honor of her new husband. It's pronounced "NIMIK," btw. Would you like occasional periodic updates of our new programs and upcoming appearances? Please send us an email. History on the Hoof to appear at the Spirit of the Jersey's State History Fair. Stacy and David will be performing as Molly Pitcher and George Washington at the annual Spirit of the Jerseys State History Fair, Saturday, May 2, 2009 at Washington Crossing State Park, Titusville, NJ. 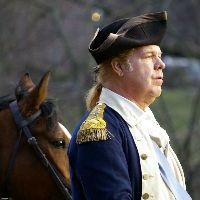 The New Jersey History-themed Fair features character interpreters, displays by reenactment organizations, historical societies and museums, antique automobiles, historical food demonstrations, radio theater, music and dance performances, and much more from distant to modern times in the State's past. This is a one of the best living history events anywhere, great for families, and there is currently NO ADMISSION. It is HUGE. Wear comfortable walking wear.